An anechoic chamber is a space designed specifically to absorb sound or electromagnetic waves. The surfaces of the space are covered in pyramids of radar absorbing material, and any radiation generated inside the room gets absorbed by the walls. 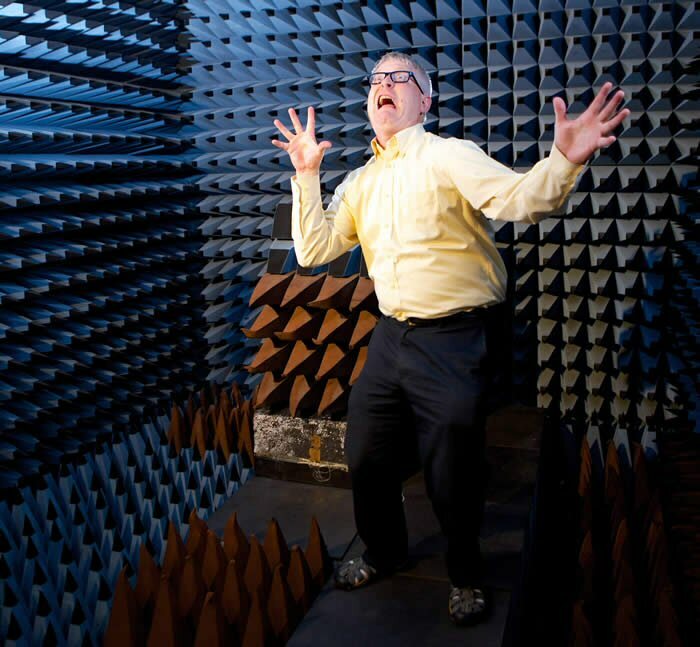 Anechoic chambers are typically used for measuring radiation patterns of antennas, or radar cross-section measurements. It's also where antenna designers go for peace and quiet. Did you ever notice that they lock the door? Anechoic chambers can be any size, from a smallish box to an aircraft hanger. There are a variety of absorbing materials that can line the inside of the box, depending on what you're measuring, but most RF chambers use pyramids made of foam embedded with conductive carbon black. The pyramidal structures must be sized according to wavelength; if you want to do 100 MHz measurements you will need pyramids several feet long. Often, the height required for a chamber is surprising, up to 30 feet or more. Long pyramids tend to sag and tear off the walls as the material is heavier than it looks. If there is ever a fire in an anechoic chamber you need to get out quickly, the smoke is toxic and you need a fire protection plan. This is something you need to carefully consider if you plan on performing high-power tests. The positioner is where you will mount your device under test. It provides elevation, azimuth and rotation control. Some masts fold down for ease of mounting your sample, some will require a ladder. check out Cal Poly's chamber description!